As I’ve written in my previous post, I moved to a new Hetzner Box. This is how I setup my virtual Host and how I moved my server, including all virtual machines, to the new data center with a downtime of a second or less. This setup is only possible if hetzner allows you to move you network via datacenter. Because fixed IP addresses are expensive wasting two of the eight IPs to have a broadcast network is not an option. Now we configure the network and routing for the virtual machines in /etc/sysconfig/network-scripts/ It should be noted, that the IP address is arbitrary. We need it becouse we cannot add a default route directly to a device, in this case eth0. Now we want to move the VM to our new server. The old server, let’s call it Hetzner-Old, is a CentOS 7 with a bridged net/29 network and several virtual machines running on it (e.g. this Blog). The VMs are running on LVMs which themself are running on crypto devices. 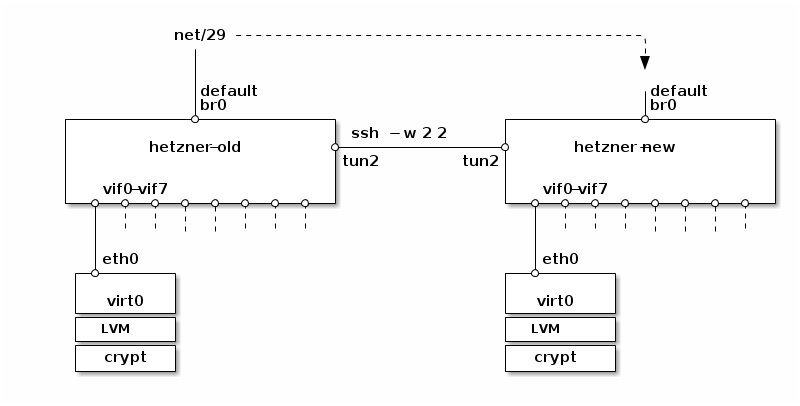 Each VM has its own LVM group. The new server, Hetzner-New is also a CentOS 7 machine. The LVM devices have the same name and are of the same size or bigger. They have to have the same names. This is also a good opportunity to make an LVM device bigger without the need to shut down the according VM. Now we add the repo for SIG Virtualisation on both machines. This way we have encrytion and don’t have to worry encryting it with TLS on qemu. That way, when one of the network interfaces of a VM (vif+) gets removed, when the VM is moved, the according route is removed. Otherwise it would try to go through the default GW of Hetzner-New, wich is not allowed by Hetzner yet. Now, when the VM starts on Hetzner-New it has no interface to this IP-Address and it’s routed through the tunnel, through the GW of Hetzner-Old. The number 201 is only internally used, therefore arbitrary. Finally we wait for Hetzner to swich the net/29 network over to Hetzner-New and throw away the previously set iptables rule. Since the new machine is in a different data center, Hetzner has to allow this moving. Because for this to work the net/29 network has to be in Hetzners core routers. With this command we wait for the first tcp package to arrive at Hetzner-New and flush our iptables rule. I recently rented a new Hetzner Box to replace my old. I moved from EX40 to EX41 and saving even some money every month :-). Every thing went smooth, but the sensors did not work. I had to use nct6775, but the module from Centos7 said “No Device”. ElRepo to the rescue. They have a nct6775 kmod available, but this module is not compatible with Centos7.4 :-(. First I had to created a fixed package. I changed only the release-number and the kversion to 693.2.2 instead of 327. The fixed version is available at: https://www.kuehnel.org/nct6775/. I also open a ticket with elrepo: https://elrepo.org/bugs/view.php?id=792. I don’t know how they will fix this. ElRepo uses kABI-tracking kmods and things like that should not happen. We will see. I can not fix the alarm for 2V (in0), but the rest looks good. Don’t forget to set the setting with sensors -s.
Update 15.10.2017: The module kmod-nct6775 is now update in elrepo directly, so only the configuration file is needed. after more then 10 years of using VMWare Workstation (Starting with VMWare Workstation 5). I’m in the process of moving to KVM/libvirt, but I want to use qcow2 with trim support. I’m using Fedora 25 with virt-manager to create my virtual machines. A lot of pages describe that very well like Chris Irwins. But I found another problem. With this RHEL7, Windows 10 and FreeBSD 11 Machines can be configured to run with trimming there images them self. To migrate you Windows 10 from “libvirt” auf “libvirt-scsi” is quite easy. Add a new libvirt-scsi Disc to an existing Installation. Install the driver for libvirt-scsi, reboot. Now you system supports this driver. After the this reboot, shutdown the machines again and change the disc type of all discs to libvirt-scsi like above and reboot again. Your system should start up with it’s libvirt-scsi enabled disc. Rinse and repeat for all disc letters. As always no warranty that this does not break you system. Posted in Enterprise Linux, Fedora, Linux	| Tagged Fedora-Planet	| Comments Off on We need 64bit, everywhere!